The progress already made by Ghana regarding the protection of Children’s Rights is impressive and exemplary for its region. However, progress that has been realised regarding education and the reduction of poverty must presently be implemented in other areas which are still problematic for children. Ghana is particularly a poor country. The Gross National Income (GNI) is, for example, more than 10 times lower than that of Argentina. Despite these unsatisfactory numbers, the exceptional progress that the country recently made reducing poverty should be noted. In fact, while making the reduction of poverty one of its priorities, the government became a considerable and exemplary success in the heart of the African continent. 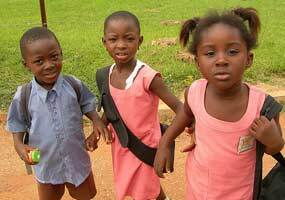 In Ghana, it is difficult to guarantee good health to children. As a result , the infant mortality rate is particularly high and life expectancy is only 57 years. More than 13% of newborns have a low birth weight. 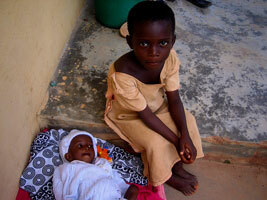 Additionally, there are not enough medical personnel to care for all the children and newborns in the country. As a result, some of them are not immediately cared for, resulting in the spread of numerous viruses. Some sicknesses are very virulent among young Ghanaians, notably malaria, tuberculosis and even HIV. In Ghana, the population is still very far from accepting and respecting gender equality. As a result, young girls are excluded from a large number of areas. Their future and their function are predetermined, and only very rarely do they integrate into areas with some social or even political importance. Also, their education is often neglected. In fact, young girls must finish their domestic duties before pursuing their own interests, such as school for example. The Ghanaians still do not accept the new vision of woman—western, modern, and present on all fronts. Unfortunately, the repercussions can sometimes be very harsh for young girls, who are often set aside and ignored. 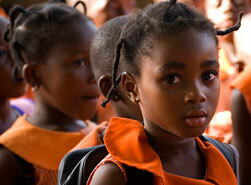 In Ghana, close to a third of children are not educated. This number may appear alarming, but, it is one of the lowest rates on the continent. School is free, but despite this, the additional costs it creates are sometimes an obstacle to universal education. As a result, in families, sometimes only some children have the chance to go to school. The others, generally the girls, stay at home and perform domestic tasks. Even if the country has allocated important resources to eradicate problems accessing education, it still affects some, most particularly young girls. More than a third of children are forced to work to support the needs of their families. Most Ghanaian children are employed on cocoa plantations, the main economic activity of the country. They are faced with deplorable, exhausting, and dangerous working conditions. This economic exploitation is also an important source of African child trafficking. In fact, many children from neighbouring countries are forced to enter Ghanaian territory illegally to be employed in the cocoa industry. Young girls are often employed as domestic servants, whether in their own families or in richer families. In Ghana, a quarter of young girls are forced to marry before the age of 18. They are trained from a very young age in their future roles as wives. But these marriages often have serious consequences on the health of young girls who don’t yet understand what marriage entails. In Ghana, close to 30% of births are not officially registered. As a result, these children don’t have an official identity or a nationality. This results in significant difficulties for these people, because they will not be able to exercise their rights as they are considered invisible in the eyes of society.